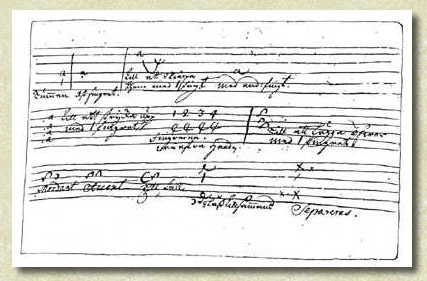 Two lute tutors in manuscript have been preserved in Sweden. 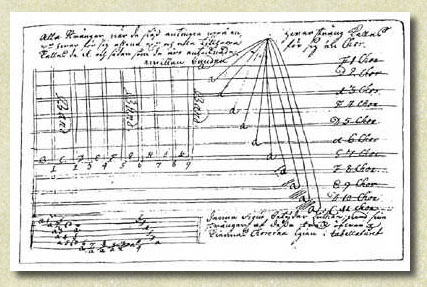 One of them is to be found in the huge and important lute tablature manuscripts KLM 21072 in the Kalmar County Museum. Neither the tutor nor the tablature section of this manuscript are of Swedish origin, even though it is quite probable that it was used in Sweden in the early 18th century. The tutor in this manuscript is in fact a copy of the one in Philipp Franz LeSage de Richée’s Cabinet der Lauten of 1695. The other tutor unquestionably originated in Sweden as it is written in Swedish. It seems to be unknown outside Sweden and will be the subject of this article. The tutor consists of four sheets in a rather small size (10 x 16 cms) bound together with a lute tablature manuscript for an eleven-course lute. As the tutor and the tablature are of different sizes and hands it cannot be determined whether they originally belonged to each other. The manuscript is kept in the Lund University Library (shelf mark Wenster G 37). The tutor is not dated, unlike the tablature section which has a very exact dating: 12 November 1712. The provenance of the latter is well documented: it belonged to a physician in Malmö by the name of Peter Platin. 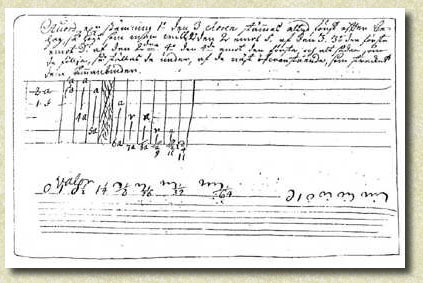 On the bottom of the first folio of the tablature section is found the following note: ‘Lutenist D: Holtz stycken på 6 fölljande ark i denna Boock’ (The pieces of the lutenist D[aniel] Holst on the following 6 sheets in this book). The tutor is written in an 18th-century hand and there is nothing to suggest that the tutor and the tablature part were not connected. It is interesting to note that you should start tuning the third course ‘after your own discretion and as high as you want it’. Beneath the tuning instruction is an explanation of time signatures in the tablature. Lilla fingret af högra handen skall stå på Liudbottn, näst innan före, eller straxt wid strängestallen under på wid qvinten, sedan skola de andra fingrarna hållas uti 1/2 Circel intet långt ifrån strängarne, på det man snarare må kunna röra dem, och skall tummen aldrig hållas in uti de andra fingren, utan altid wara wähl åtskild ifrån de andra fingren. Wänstra handen skall således hållas, att tummen allenast sättas underst på Luthhalsen, wid quinten och sedan de andra fingren ofwan på strängbordet, wähl åtskilda ifrån hwar andra, i rund som 1/2 Cirkel, och skola intet långt ifrån strängarne lyftas upp när de flöttias ifrån det ena grepper eller laget, till det andra, då de närmare äro att sättias på strängarne, och faller det så lättare till att spela. Tummen skall altid under halsen hållas mitt emot det första fingret på strängbordet, och då det flyttes ifrån sitt ställe, flytter och han med, och skall han aldrig röra på halsen med Basarne, utan altid nere wid qvinten, hwar igönom spelet både prydes, och faller lättare. När som tummen på högra handen slår på någon sträng, som gemenligen Basarne, hwar till han mäst bruckas, skall han ey strax lyftas upp, när han slaget, utan ligga stilla på den nästföljande strängen, till des han skall bruckas igien till att röra någon annan, och skall det straxt och fast skee. så att bägge strängerne wähl höras, der till med skall hållas rätt, och intet inbögd uti handen. 4. De 4 fingren af den wänstra handen, när de sättias på strängbordet, eller halsen, till att röra några strängar, skall det skee med all kraft och styrka, så att när strängen röres, han och måste hafwa ett rent Liud, hwilket och äfwen måste skee med tummen och fingrarne af högra handen, så att alla de stränger som tabellaturet utwisar skola röras wähl, hwilket skeer då man fast och starkt slår uppå dem, särdeles skall en som begynner att spela, taga detta i akt, så att han härtill anwänder styrkan, af bägge händren, oaktat det strängarne mer nötas der utaf. Sifrerne som stå uti Tabellaturet utmärka hwilket finger af wänstra handen skall bruckas, begynnandes räckna näste fingret ifrån tummen: som för det första näst hoo står 1. der näst 2. det efter 3. och altså 4. för det lilla fingret, de 2:nne förste fingren på den högra handen utmärkas med små prickar som . för det första, och .. för det andra, a [med en punkt under] sign:t 1 a [med två punkter under] sign:t 2 fing:t a [med litet lodrätt streck under] sign:t tummen. The little finger of the right hand shall be placed on the belly next to the bridge beside the treble string. The other fingers shall be kept in a semicircular shape not far away from the strings so that you will be able to touch them quicker. The thumb shall never be kept inside the hand, but always well apart from the other fingers. The left hand shall be kept so that the thumb only is placed at the very bottom of the neck opposite the treble string. The other fingers shall be placed on the fingerboard in a semicircular shape, well separated from one another. The fingers shall never be lifted much above the strings when they are moved from one stop or position to another. It is much easier to play when the fingers are close to the strings. The thumb shall always be placed on the neck opposite the index finger on the fingerboard. When the index finger moves the thumb follows. The thumb shall never be placed on the bass side of the neck, but always on the treble side. The playing will then become more beautiful and easier. When the thumb of the right hand hits a string, usually one of the basses, for which it is mostly used, it shall not be lifted immediately after it has hit, but rest on the following string until it shall be used again to touch another. You shall touch quickly and strongly in order to get both strings of a course to sound well. The thumb shall be kept straight and not bent into the hand. The four fingers of the left hand shall be placed firmly and with all strength on the fingerboard or the neck [?] when some strings are to be stopped in order to get a pure sound. The same also applies to the thumb and the fingers of the right hand. All the strings which are shown in the tablature shall be touched carefully, which is achieved when you hit them firmly and strongly. This is of particular importance to the beginner and he must use the strength of both hands, although the string will get more worn by this. The numbers which are to be found in the tablature show which finger of the left shall be used, starting with the index finger 1, the middle finger 2, the ring-finger 3 and then the little finger 4. The index finger and the middle finger of the right hand are denoted with small dots, as . for the index finger and .. for the middle finger. a [with one dot below] means the index finger and a [with two dots below] the middle finger and a [with a vertical, short line below] the thumb. As can be seen there is a good deal of excellent advice in the tutor and the most important aspects of lute-playing are treated. The author uses the word ‘touch’ and ‘hit’ as alternatives for pluck, which shows an indistinct terminology, but the most common word seems to have been ‘hit’ (slå; compare with the German equivalent: ‘die Laute zu schlagen’). This article was first published in The Lute Volume XXVI Part 2 (1986) pp. 75-80.